Hello! I'm Emily. 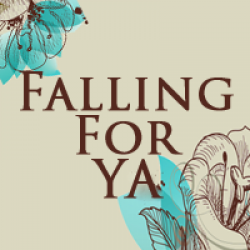 I am a YA Book Blogger at Falling For YA, Third Year Law Student at the University of South Dakota, and lover of all things bookish. Indelible is something that can not be forgotten or when referring to ink it is something that can not be erased. This is the concept on which the world of the Twixt is based. The story begins with Joy and her best friend going out to a night club, from across a crowded room she spots a boy clad in all black. I know what you’re thinking, City of Bones much?, we’ve read this story before. Luckily that is where the similarities end, as the boy begins to approach he is determined to kill Joy and actually ends up cutting her eye this leaves his indelible mark on her. I really enjoyed the world building in Indelible. At times it was a little hard to follow just because it was so different that I had nothing else to base it on. The story is part fey folklore, and part Spirited Away (one of my favorite movies by the way). I was constantly surprised by what transpired and once Joy enters the world of the Twixt the action never lets up. Joy was a fun heroine and one I really liked. She is not perfect and has real life problems. Her mother and father recently got a divorce and her mother moved to California basically abandoning her, her brother is off at college and too busy to call, and then her Dad is starting a relationship with a new woman. Joy is balancing all of these very big, very real problems and navigating this new world she has been abruptly thrust in to. I liked that her real life problems were not forgotten as she has to deal with her fantastical ones. The world of the Twixt definitely brought about it’s own set of issues. Namely, Ink and Inq. Ink and Inq are siblings, they are two halves of a whole. Ink is mysterious, dark, and rather emotionless in the beginning. He has one goal and that is to do his job, he doesn’t care about those around him and has never really lived. Inq is his foil she is outgoing, welcoming, and has a couple of human play things on the side. I liked to see their interactions and the different ways they treated Joy. The romance between Ink and Joy was different to say the least. I wasn’t even entirely sure they liked each other very much in the beginning, but as the story progressed so did their relationship and I looked forward to the moments they shared together. I have to say I definitely swooned over Ink. He was just the type of dark, mysterious, YA male lead I love! 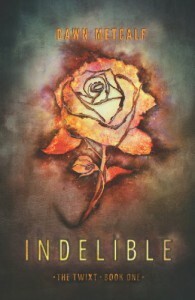 Overall, I really enjoyed Indelible the characters, world building, and swoon-worthy male lead made putting this story down nearly impossible and I am now eagerly awaiting the next book in the series! I received an ARC copy of this novel from the author in exchange for an honest review.